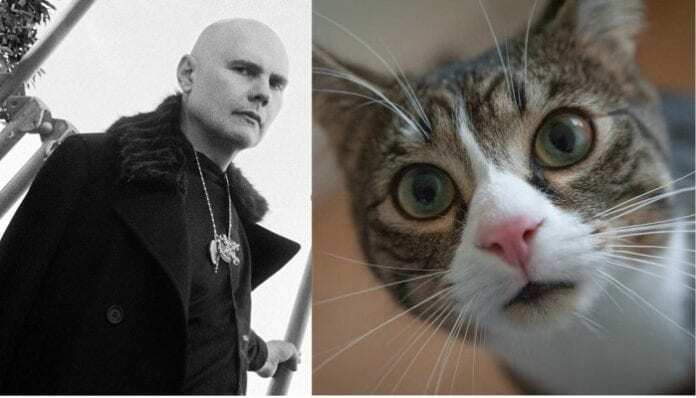 Is Billy Corgan nothing but a feline in his mind? Burn down the sun—Billy Corgan’s not everyone. In fact, so singular is the Smashing Pumpkins frontman’s mystique that he’s now gracing the cover of cat rescue magazine PAWS Chicago for the second time. See it below. Back in 2014, Corgan first appeared on a meme-worthy cover of PAWS Chicago. After teasing his return to the mag in a New York Times profile, he’s now back with his cats Angelface and Diamond Baby, both PAWS Chicago adoptees. Shiny + Oh So Bright – the Summer/Fall 2018 issue of the PAWS Chicago magazine featuring @SmashingPumpkins @WilliampCorgan and @ChloeMendel is here! Read more about William’s new album and tour and Chloe’s faux fur business that supports homeless animals. Link in bio! Pick up a copy of the new magazine at the Smashing Pumpkins concert in Chicago this Monday and Tuesday. Copies of the newest edition of the magazine will be available in honor boxes in the coming weeks!